For those wishing to do a lazy tour of Cambridge most University Colleges can be viewed from the roof garden. Enjoy a glass of champagne from our extensive drinks menu, or a cooling glass of Pimms and lemonade lounging on the sofas, relaxing, as the world passes by below. 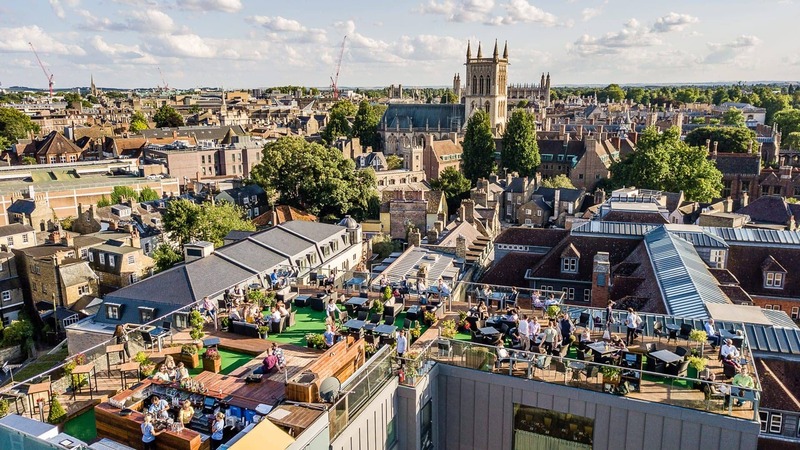 The Roof Terrace Bar and BBQ is now closed for the winter, however, if you are staying in the hotel and would like to view The Terrace please ask one of the Managers and if the weather is kind we will try to arrange this for you. Due to the possibility of adverse weather, we do not accept reservations. During busy periods we are unable to accommodate large groups.